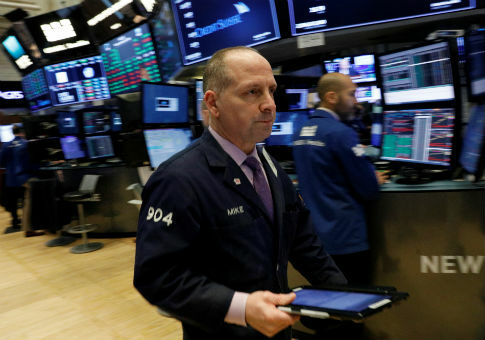 NEW YORK (Reuters) – The Dow briefly fell more than 10 percent from its Jan. 26 record high on Monday before paring losses to trade above its lows of the day. Both the Dow and S&P 500 were last down more than 3 percent, while the Cboe Volatility index jumped more than 100 percent on the day and hit its highest since August 2015. The Dow Jones Industrial Average fell 938.27 points, or 3.68 percent, to 24,582.69, the S&P 500 lost 81.16 points, or 2.94 percent, to 2,680.97, and the Nasdaq Composite dropped 174.27 points, or 2.41 percent, to 7,066.67. This entry was posted in Issues and tagged Stock Market. Bookmark the permalink.